The #1 Real Estate Investment Calculator and Amortization Software for Note Buyers, Note Brokers and Investors! No cash flow is unsolvable. Knowledge is power! Savvy investors never rely on someone else to run their financial calculations. Compare calculations with note buyer bids to assure you receive the best possible pricing. 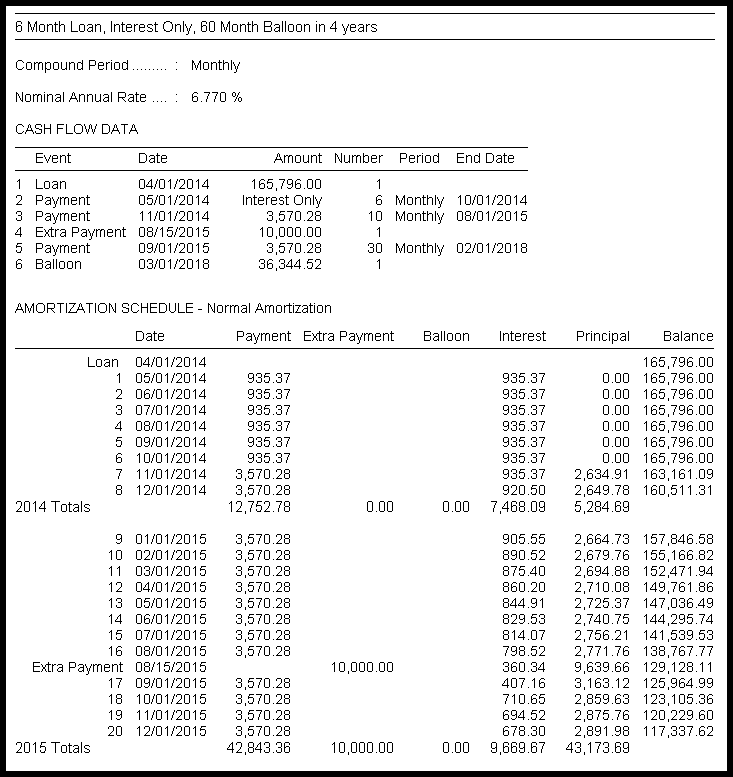 Avoid common mistakes when calculating cash flow notes. Use with your marketing offers to provide free amortization schedules to note sellers. Negotiate partial purchases, tail-ends, and buy full-sell short strategies for enhanced yields. Recast notes and run unlimited “what-if” scenarios for improved return on investment. Calculate balloon mortgage note payments with balloon extension options. Analyze complex calculations including interest only notes, uneven mortgage payments, and more. Generate Schedule B amortization tables for early partial payoffs or split partials. Create repayment plans for workouts and modifications on non-performing or delinquent notes. Develop private investor relationships and self-directed IRA funds with professional printouts. When you check out, use coupon code "TVNOTE" - Note Investor Members get $22 off the retail price of $149.00 with coupon code "TVNOTE" – For a total cost of only $127.00. Solve All Financial Calculations Involving Time and Money! While the note business is a niche market this software is mainstream. The Top 100 accounting firms and more than 500,000 financial professionals worldwide rely on its accuracy and flexibility in generating detailed amortization schedules. TimeValue Software™ TValue™ amortization software is the best and most accurate amortization software, and proven industry standard for accurately structuring notes, mortgage payments, interest calculations, and any time value of money computation. Join other note business and financial professionals who rely on the accuracy and ease-of-use of TValue amortization software. The TValue program is perfect for computing mortgage payments, checking interest due on a note, determining the payoff amount, or calculating the yield of a real estate note investment. TValue software will even calculate the most complex cash flow notes, including partial purchases, split payments, uneven payments, interest only, and balloon payments. See an example of the financial calculator at work in the screen shot below. A. 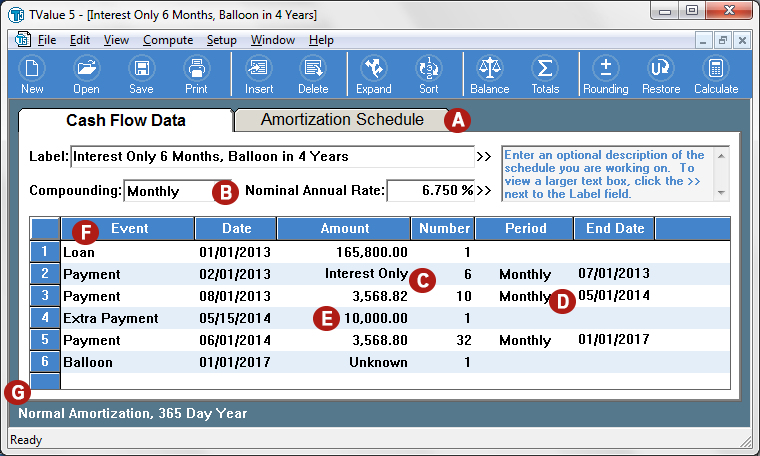 Print amortization schedules and APR disclosures in seconds. B. Choose the right compounding or rate period from the list of 13 methods. C. Select Special Series for unique payment options, including interest only, fixed principal plus interest, monthly skip, and more. D. Set payment periods independent of compound/rate periods. E. Payments can be irregular in amount and occurrence. F. Enter events such as loan/payment, lease/lease payment, deposit/withdrawal, invest/return or customize event names. G. Computation options include normal amortization (compound interest), U.S. Rule (simple interest), Rule of 78, Canadian amortization, and 360, 364, or 365-day year lengths. Detailed reports provide the interest and principal components needed to print amortization schedules and APR disclosures in seconds! Totals can be displayed at selected intervals and TValue amortization tables can be easily exported to Microsoft Word or Excel. The hand-held financial calculators are great options for computing on the go but they have their limitations. It is very easy to make errors by entering the wrong value into one of the keys. Most people find uneven cash flows to be difficult on traditional calculators. Without a visual recall it’s common to lose track of the input and the accuracy suffers. TValue software allows you to save and print your calculations for review and future edits. The good news is anyone familiar with the HP12C, HP10B, or TI BA-II Plus will find the input on the TValue software very similar to the keystrokes on these handheld financial calculators. While “doing it yourself” in Excel spreadsheets is possible, there are significant reasons why it’s better to use the TValue™ amortization software. When it comes to notes, loans, payments, rates of return analysis, and other time value of money calculations, flexibility is paramount. Excel is based on writing formulas and there is always room for user error. On a complicated transaction, you can work on an Excel spreadsheet for too long only to discover that you have bad data or an error in a formula or worst yet you may never know there is an error. There is a better solution. Faster, accurate, and easier to use. TValue software only takes a couple of line items to structure a deal or analyze a return. Error free calculations. You can have confidence in the numbers as TValue software calculations are based on embedded algorithms, not writing formulas. If the amounts and dates are right, you know that the calculations will be correct. Amortization schedules in seconds. Schedules for documentation are generated instantaneously for viewing, exporting, and printing. Solve for any “what if” calculation. You can quickly and easily do multiple “what if” scenarios in minutes and find the best solution quickly. You can easily and quickly solve for the interest rate, the payment, the loan amount, or the term. Logic to handle the simple to the most complex. Calculation logic is already included. Unconditional one-year money-back guarantee anytime during the first year after purchase. An optional annual maintenance service is available when ordering product at the cost of $35. The TValue software annual maintenance service includes future updates and upgrades, unlimited product support, and access to the 75+ TValue software online training videos. As a real estate investor, note buyer, note broker, or financial professional, you need to choose and rely on a tool that is accurate, easy to use, and gives you the documentation you need. Software will be delivered online as a download after purchase. When you check out, use coupon code "TVNOTE" to save an additional $22.00 off! Note Investor Members get $22 off the retail price of $149.00 with coupon code "TVNOTE" – For a total cost of only $127.00.